Hi All, I filled a big order for PVC flutes recently so I thought I would document the process. I get inquiries for these but often do not make them as they are not cost effective so I am posting simple instructions for those who can not afford a usable flute. Warning, PVC can emit dangerous fumes if heated (saw, drill) so work safely in a well ventilated situation, out doors preferably. 1) 3/4" Internal Diameter PVC tube. 3) Hack or Hobby saw. Sand areas that will be glued then attach coupling. Knock it snug on the floor. Cut half off with hack or Hobby saw. Draw upside down "T" to position front and blowing edge. Cut at around 30 degrees angle depending upon Ryu. Back is slant down towards the chin slightly. Use heavy Wood rasp file then fine Mill file to clean up the front of the utaguchi. A small half round file can remove burrs or a paper thin "membrane" on the blowing edge. gives a perfect F for an experienced player. In my opinion, this spacing allows the flute to play well in tune within both ocaves with very minimal adjustmentsi. One of my favorite tools. A Dremel undercuts quite easily. Smal half -round file removes burrs. The rest can be cleaned up or smoothed out with a rolled piece of 200 grit sandpaper. Five fully functional flutes with one pipe and three coupling. (Please know that some teachers welcome any flute into a first lesson while others will not allow you to bring a PVC flute within 100 yards of them). Thanks for those instructions, and complete with clear pictures! Cut at around 30 degrees angle depending upon Ryu. I'm a bit confused by this step. Does "depending on Ryu" mean Kinko or Tozan? Which is the steeper angle? Would that make a difference in the angle the flute needs to be held to play in tune? Thanks Chris, You may recall the thread Jaques started a while back about different utaguchi angles and how they affect the player and sound production. : http://www.shakuhachiforum.com/viewtopi … 04#p20904. I'm a bit confused by this step. Does "depending on Ryu" mean Kinko or Tozan? Which is the steeper angle? Both Kinko and Tozan flutes have modern angles at around 30 degrees. Older flutes made in the Myoan style or even older are less perpendicular on the front. I've seen some at almost 45 degrees. I make most of my Hocchiku with an angle of around 35-40 degrees. A Choukan with a wide bore can be more alluring when played with a close embouchure as the default position rather than blowing in the Kari used with modern flutes. A less perpendicular utaguchi combined with a closer embouchure facilitates the fundamental tone. This does not mean that the older flutes should be played in the Meri position, but with relaxed lips almost covering the utaguchi. Would that make a difference in the angle the flute needs to be held to play in tune? If the finger holes are in the right place and the aspect ratio proper, a flute will play pretty well in tune. But how well is dependant upon the player's understanding on how to play different flutes and his/her technical ability to play in tune. Old flutes are made to be played in the way the makers played. Modern flutes are made to be played in the way modern musicians play. When Perry said "I make most of my Hocchiku with an angle of around 35-40 degrees." the light came on. We've got two of Perry's Hocchiku flutes and I have to fight tooth and nail to get a sound out of them. My wife has no problem at all with them. We've also got a 1.8 Ji-ari Yung Flute and a Chikusing by Perry that I have no problems with. What a relief to read the above post about the angles. I thought the Hocchiku's just didn't like me. It's bad enough having the cats favoring my wife but flutes too? Now I understand and will adapt to the flute. I'll sleep better now knowing I won't have to make that long trip to the crossroads and sell my soul in order to blow Ro on the Hoccichu. Got my mojo working. When some say that a flute builder will make the flute to fit his/her playing style, it is totally true, but a lot of it has to do with their chin, jaw, and lip relationship, as well as their embouchure. The first few flutes I purchased, some were a struggle to play, some were not. I realized that my chin does not jut out excessively, so when I place a flute against my upper chin, the angle and relationship to my airstream to the utaguchi angle will not be the same as someone like Jay Leno. Also for me, wider bore flutes need to have a much deeper angle to the chin relief, because the distance between my lip and the point at where my chin begins to jut out is shorter than most folks. I began to carefully change the chin relief on wider bore flutes I bought when I could, in order to fit me better, making sure not to file/sand through the ikigaeshi. I have at times also changed the utaguchi angle slightly, but you definitely run the risk of changing your tuning if you make the utaguchi deeper by changing the angle. A deeper cut on an utaguchi will shorten your flute length and will make the pitch slightly higher, so I would not suggest anyone mess with it unless there is room for tuning where a millimeter or two will not effect the tuning in a negative way, or you can adjust the holes to even things out! Now all of the shakuhachi I play I make myself. I have recently made some flutes for others that I custom fit for them. One was a beginner with protruding teeth, very recessed jaw and chin, and she was able to blow a good solid RO within the first few minutes. She could not do that on any of the flutes I made for my own use nor the ones her mom had. She was really frustrated and thought she was stupid and could not “get it”. She just has a different shaped face, and it is perfect just the way it is. The other flutes she tried were just not suited for her. When Perry said "I make most of my Hocchiku with an angle of around 35-40 degrees." the light came on. We've got two of Perry's Hocchiku flutes and I have to fight tooth and nail to get a sound out of them. My wife has no problem at all with them. We've also got a 1.8 Ji-ari Yung Flute and a Chikusing by Perry that I have no problems with. What a relief to read the above post about the angles. Look at your wife's lips and see what she doing differently! Sometimes it's a simple adjustment of the embouchure or angle of airstream. Other times, it can be a problematic Central Vermillion Tubercle - the area marked A. Players with a protruding Central Vermillion Tubercle such as the owner of these lips can have difficulty starting out. But, they can still learn to play masterfully once they've figured out how to blow slightly to the side. This set of lips will have an easier time learning how to get that first note with the shakuhachi. Taldaran, Some people can have difficulty for all the reasons you mentioned, and more! While others may simple make a sound right away on any flute. I had a beginner over at my place last week trying flutes. He started on a YUU and had been playing a year on his own. Never had a lesson. 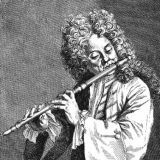 He was able to blow two full octaves musically on every flute he tried! These were Earth and Hocchiku. I was quite impressed. Not many players can do what he did in such a seemingly effortless manner! In the end, some flutes are just harder to play for many reasons.